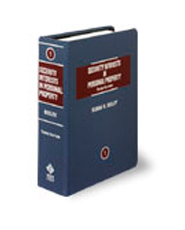 A practice guide to all aspects of secured transactions, Security Interests in Personal Property provides full text and detailed analysis of the original and revised Article 9 of the Uniform Commercial Code (UCC). This text contains first interpretations and issues under the original article and the response of the revised article for quick determination of the impact on specific issues. The Uniform Commercial Code: Where did it come from? Where is it going? History and Future. Secured and Unsecured Credit: Significance of Lein Status. Scope of Application of Article 9. Structure of Article 9, Terminology and Collateral Classifications. Article 9 as a Commercial Engine: Three Key Concepts. Creation of Security Interests: Attachment. Drafting Notes and Security Agreements for Commercial Transactions. Creating a Security Interest: Perfection. Errors and Changes that may Affect Filings. Collateral Subject to Federal Title Registration Systems. Accessions, Products and Commingled Goods. Insurance As Proceeds and As Collateral. Intangibles: Intellectual Property, Licenses, Softward, Payment Intangibles. Chattel Paper and Leases of Goods.